A part of my job allows me to plan extravagant cocktail events around the country. Sweet deal, eh? Well, my last event was held in San Francisco and I was lucky enough to have it at RN74, Michael Mina’s 2010 James Beard-nominated restaurant. Food and service were great. A few minor hiccups, but overall a great party. RN74 is situated at the bottom of the Millennium Apartments in the FiDi. The restaurant attracts a beautiful businessy crowd, someplace I’d never have a chance to go on my own. Our party was set by the lounge area on the right-side of the restaurant. We didn’t get a private bar, but we did have 1 waitress collecting orders and a server pouring $100 bottles of wine. Service was great. A tad-bit understaffed, though. Pre-event planning was awkward. The events manager couldn’t give me an estimate as to how much our party would cost. I was on a strict budget for our party of 60 (which later turned out to 80), and the events manager kept insisting a few trays of cheese, smoked fish and these little veggie and meat cups would be enough. But, we ended up ordering a load of extra food, about $7k worth. What impressed me was their car service. After the event, I stood outside the restaurant waiting for a cab. The valet asked if I needed a ride and offered their town-car and said it would be the same price as a cab. When I got into the car, I asked how much would it roughly be to get to my home since I only had a few dollars on me. The driver insisted I could pay anything I wanted! I couldn’t believe it! Anything, really? Wow, this event really gave me a taste of life of the rich and famous. We had a ton of food at our party, so I’ll only point out the most memorable. 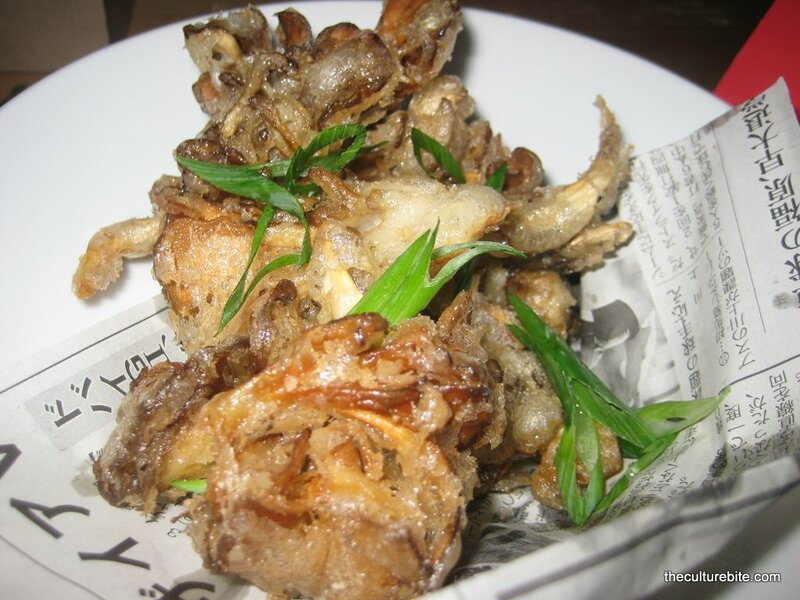 Maitake Mushroom Tempura – My absolute FAVORITE! I literally had 2 whole servings of this dish. The mushrooms were lightly fried and salted and the meat was tender and fluffy. Potato Ravioli – These raviolis were stuffed with creamy mashed potatoes! What more can I say? Hangar Steak – This steak is like butter. Not the best steak in the world, but it was mouth watering. Smoked Fish – The assortment of smoked fish was impressive. A little overwhelming since the platter was so huge. All the fish eventually tasted the same. Cocktail – Pimm’s 74 – I’m by no-means a drinker, and I was handed this drink by a co-worker. The Pimm’s 74 is RN74’s specialty cocktail drink consisting of house-made “Pimm’s No. 1,” ginger beer, campari and prosecco. As garnish, a slice of orange and cucumber. It was much like a fruity champagne, but incredibly strong. I set the cup down after my 2nd sip. The one thing I regret not ordering is dessert. It’ll have to be a really big special occasion before I come here again. « San Francisco Public Library – Richmond Eats!